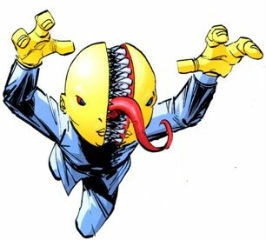 Powers: OpenFace has a second mouth which opens up down the middle of his head and contains rows of razor sharp teeth. This jaw possesses increased strength to allow a stronger grip. OpenFace was a scientist within the Vicious Circle who grew frustrated with the method of leadership employed by OverLord. He set about working with his fellow scientist, Octopus, on finding a way of removing OverLord from power. The duo broke into the main warehouse of Donner Electronics in search of a device that could grant them command over CyberFace, recently resurrected by the United States government’s Project: Born Again and in a weakened mental state. Dragon confronted OpenFace and when his head was engulfed by the larger mouth of his foe, the hero bit out OpenFace’s tongue to defeat him. A stay in Stronghold Penitentiary followed although OpenFace attempted to escape when CyberFace orchestrated a mass breakout during the Gang War. He failed to regain his freedom but he was eventually liberated by miniaturized members of the Vicious Circle. OpenFace reunited with Octopus, serving alongside PowerHouse and Baby Boom as the inner circle of CyberFace as they mounted a rebellion against Horde. CyberFace was killed by Hitler’s Brain, leading to the rebirth of both BrainiApe and OverLord. PowerHouse masterminded the defeat of both of these new rivals and took over the leadership of the Vicious Circle, with Octopus and OpenFace as his lieutenants. The two scientists worked alongside a shrunken Dataman to restore the miniaturized Vicious Circle members using a recovered Martian weapon. In the reality that Dragon ended up in after his confrontation with Damien DarkLord, OpenFace had been one of those villains that refused to pledge loyalty to CyberFace. This rebel faction of the Vicious Circle joined Dragon’s rebellion against the King of the World, only for them to be apprehended by the new Liberty League. The Vicious Circle later reformed with SkullFace as their leader and he had a vendetta against his fellow veteran members. He ordered Octopus and OpenFace to eliminate Dragon but the duo refused to take part in the murder of a man that had saved the entire planet more than once. They instead faked their own deaths and remained hidden for several years, plotting their own rise to power. When the OverLord armor fell down from space and was recovered by the Chicago Police Department, Octopus and OpenFace used remote control to take possession of it. They fired off a photon blast that annihilated the precinct and killed all of the human police officers present. Their plan to take over the Vicious Circle using the armor as a proxy failed when Dataman betrayed them to someone who became OverLord III. After their laboratory was destroyed by the new OverLord, Octopus and OpenFace fell in line as the lieutenants of the Vicious Circle’s new leader. They oversaw the creation of the Dragon Army which brought the villains to the attention of Dragon’s newly restored original Emperor Kurr persona. He went after OverLord and looked set to kill him before Octopus and OpenFace joined the fray, meeting their ends at the hands of Kurr.